Gōng xǐ fā cái! Happy Chinese New Year! Chinese New Year (Traditional Chinese: 春節, Simplified Chinese: 春节 Pinyin: Chūn Jié), literally translated Spring Festival is the start of the Chinese Lunar Year and one of the world’s biggest festivals. Not only has it a different date, it’s customs also vary from its Western counterpart. One is that it takes place over the course of two weeks where Chinese will see their family and friends for reunion dinner or specific festivities. Chinese New Years is celebrated according to the lunar calendar. This means that the celebrations can start anywhere between 21st of January and 20th February. Celebrations typically last for 15 days, making it the longest festival in the Chinese calendar. The day itself is a public holiday not just in China but in many other countries, including the Philippines, Malaysia, and Indonesia. Why is it called the Spring Festival although it’s in the middle of winter? This is because the ancient solar calendar, which depicts 24 periods through the year, classifies the start of Spring as the period from 4th to 18th of February. It is considered good luck to thoroughly clean the house for the festival, thus getting rid of any bad feelings. Failing to do so can bring dishonor and bad luck to the family rather than the good fortune that everyone would like. However, from New Year’s Day to the seventh day, sweeping and throwing out the garbage are forbidden, lest you throw away the new year’s good luck. The Chinese usually start their celebrations with a reunion dinner, gathering the whole family over a big meal on the eve of the Spring Festival. Typically, this meal is extra special with treats, delicacies, plus the usual fish and chicken. It’s also a great opportunity to exchange gifts. As red is the lucky color, Chinese streets and houses will be decorated with pretty much anything in that color, ranging from lanterns to banners and everything in between. Most homes will include strips of red paper, known as “Chunlian”. These contain messages known as Spring Couplets and usually convey messages of good health and fortune. A typical decoration contains four Chinese characters in gold writing – these are known as “Hui Chun”. Kids traditionally receive gifts of cash in red envelopes. It’s also common for an employer to hand these out to their employees as bonuses, bringing luck to the company. Chinese New Year is the best occasion to display fireworks. Whereas the Western celebrations often times mostly relay on colorful displays, the Chinese are looking to scare away evil demons and spirit. Hence, it’s important that the crackers are as loud as possible to be most effective. This doesn’t mean that there won’t be any huge displays in the air though. The celebrations typically end with a Lantern Festival on the eve of the 15th day. Family and friends will release flying lanterns into the skies after the have met for a good meal. The Lantern Festival falls on the night of the first full moon of the Chinese New Year. Children remain off school throughout the holiday period, and can even go a whole month before returning to the classroom. 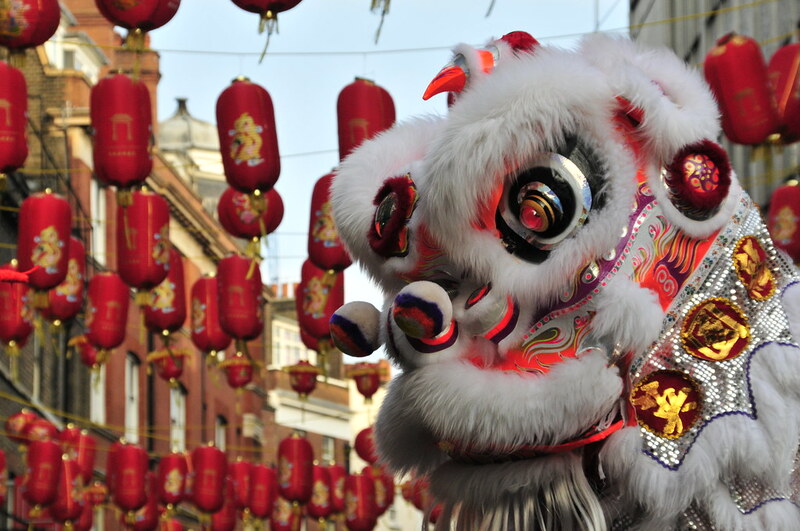 No list of fun facts about Chinese New Year would be complete without mention of a monster! Tradition says that Nian, a ferocious beast who preys on humans, emerges from his hiding place on New Year’s Eve, but is frightened off by the red decorations and banners! Traditionally, Chinese would serve fish on New Year’s which symbolizes abundance, and a sticky fruitcake called Neen Gow or Nian Gow. Why rice cakes? The “gow” sounds like the Chinese word gāo (高), which means “high.” Eating Nian Gow symbolizes the desire for the coming year to be better than the last. Shou Sui is the practice of staying up until midnight as a family to greet the new year. To ensure a prosperous New Year, Chinese lore has a rather long list of things you must not do during the Spring Festival: No saying “negative” words like “death” or “sickness”, no using scissors or knives, no cutting hair, and no fighting, just to name a few. Wealthy Chinese people are increasingly using the holiday time to travel abroad. In 2018, 6.5 million Chinese were expected to travel outside of the country for the Spring Festival. Chinese family and friends have another tradition during their New Year get-togethers: they gamble. Mostly with simple card games, the players enjoy a good time and the occasional win which they sometimes even write down for the next years to come as to know the outcome of several sessions. In Chinese astrology, each year is related to a Chinese zodiac animal according to the 12-year cycle. 2018 is an Earth Dog Year. Years of the Dog include 1934, 1946, 1958, 1970, 1982, 1994, 2006, 2018, and 2030… The Dog occupies the eleventh position in the Chinese zodiac, after the Rooster, and before the Pig. According to Chinesenewyear2018.com, “A Dog’s most defining characteristic is their loyalty. They will never abandon their friends, family or work. Honest and just, they are popular in social circles. Everyone needs a Dog friend for advice and help. They are also good at helping others find and fix their bad habits. If you want to learn more about China and the Chinese language, check out our section on Asian languages or Geography Now! China here. Do you need help localizing your products to enter new markets? Being a true sports guy, Sebastian will assist our translators with his sports betting knowledge. Coming from a marketing and linguistics perspective, his blog posts will keep you updated with the latest news to boost your iGaming business. Having lived in different English speaking countries he is switching between American and British English with the occasional Aussie word. Please go easy on him.